As Ukrainians prepare to vote for a president in the runoff scheduled for April 21, electoral rhetoric is becoming increasingly divisive and, in some cases, more extreme. 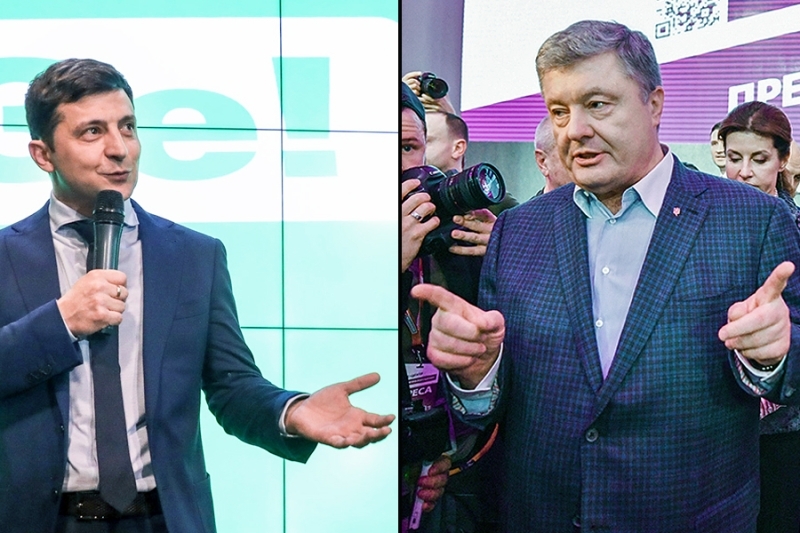 On Tuesday (April 9), the incumbent’s campaign put up billboards with a photo of Poroshenko seemingly facing off against Russian President Vladimir Putin, above the slogan, “April 21. A decisive choice” (Tsn.ua, April 9). The posters thus serve as a visual reminder of the campaign’s unofficial motto—“either Poroshenko or Putin”—which sought to characterize a victory by any of the other candidates as beneficial to the Kremlin. Indeed, yesterday, in an interview with Novoye Vremya radio, Poroshenko again returned to this theme by boldly declaring that his defeat would mean a “threat to the state’s existence” (Novoye Vremya, April 10). Many of Poroshenko’s supporters are convinced that Zelensky is prepared to establish direct communication with the Kremlin and, if elected, could end up sacrificing the country’s national interests—including over annexed Crimea and partly occupied Donbas. During a recent interview on Ukraine TV, Zelensky stressed the necessity to implement the Minsk Two ceasefire agreement, adding that Kyiv and Moscow should establish direct negotiations under the supervision of Ukraine’s Western partners (Liga.net, April 8). It is important to note that Zelensky has never rejected the country’s course toward the North Atlantic Treaty Organization (NATO) and the European Union, which the parliament wrote directly into the Ukrainian Constitution two months ago (see EDM, February 28). Nevertheless, on the campaign trail, he has publicly called for organizing a referendum over Ukraine’s membership in NATO (Zn.ua, April 7). Many in Poroshenko’s team considered this statement a step backward from the years of efforts to pull the country away from Moscow’s sphere of influence. The ramped-up campaign rhetoric along with accusations of other candidates’ alleged ties to the Kremlin threaten to further split Ukraine politically and pave the way for possible open confrontation between Poroshenko’s and Zelensky’s supporters. Notably, the election has already revealed deep divisions within the Ukrainian military. Of the troops serving in Donbas (as part of the Joint Forces Operation), 9,927 cast their vote for Poroshenko in the first round, while 9,718 voted for Zelensky (Fakty.com.ua, April 1). In certain quarters, political speech has already slipped into the realms of extremism and outright calls for violence. On a recent episode of his podcast, local activist and leader of the highly conservative religious-political organization “Bratstvo” (“Brotherhood”) Dmytro Korchinsky called on his listeners to “convince” Zelensky’s voters into switching their allegiance to Poroshenko “using a baseball bat.” Otherwise, Korchinsky continued, “such voters have to be considered terrorists and eventually killed” (Uaportal.com, April 6). Similarly, on his Facebook page, Ayder Muzhdabaev, another a famous Ukrainian journalist and activist called for shooting Zelensky’s supporters. As he explained, “a pro-Russian majority in Ukraine does not allow us any other means to save the country” (Vesti-ukr.com, April 1). The post was deleted a few hours after its publication. But it nevertheless sparked vociferous arguments on social media, with many commentators openly expressing their support for such violent actions. If such escalation continues unchecked over the coming days, the hostile rhetoric could spill out into the streets and transform into real violence. Poroshenko’s reelection campaign in some ways resembles former Russian president Boris Yeltsin’s reelection in 1996, when the latter was challenged by the then-leader of the Communist Party, Hennady Ziuganov. In that presidential race, Yeltsin’s political strategists also broadly employed sharp, antagonistic speech, warning of the Communists’ return at the ballot box. The strategy worked not only to bring out pro-Yeltsin voters but also riled up Western partners who feared a possible restoration of the Soviet Union. Collectively, Russian oligarchs agreed to back Yeltsin and provided him with broad assistance, including financial and media sources, which helped the incumbent to secure a second term in the Kremlin. Petro Poroshenko’s current political situation is different in several key ways, however. For one thing, the Poroshenko campaign’s charges of a Kremlin link ring hollow: no one has unearthed any clear indications that Zelensky intends to drive Ukraine back into the Russian orbit. Furthermore, local Ukrainian oligarchs are far from united behind any candidate and have largely sought to hedge their bets throughout the presidential race, uncertain of who the next head of state is likely to be. The country’s sixth-richest oligarch, Ihor Kolomoyski, who left the country two years ago, is widely suspected of being Zelensky’s patron. In 2012, Kolomoyeski’s television channel 1+1 signed a ten-year contract with Zelensky to air his show “Quarter 95”; and the two men retain close business relations (Gordonua.com, November 28, 2018). But the extent of Kolomoyski’s alleged involvement in the Zelensky campaign itself remains an open question. And indeed, according to phone records released by a head of Poroshenko’s Bloc, Artur Gerasimov, Kolomoyski backed another candidate, former prime minister Yuliya Tymoshenko, who came in third place in the first round of elections (Liga.net, March 12). Similarly, last fall, investigative journalists from Radio Liberty uncovered a private meeting between oligarch Viktor Pinchuk and President Poroshenko that reportedly took place in administration offices. And during 2018, Poroshenko appeared three times on the talk show “Freedom of Speech,” which airs on ICTV, owned by the oligarch (Radiosvoboda.org, December 13, 2018). Nonetheless, Pinchuk’s various media outlets have provided relatively equal access to all the main candidates in the run-up to election day on March 31, thus suggesting the billionaire was considering neutrality as his best option (see EDM, February 13, 2019). Interestingly, Zelensky won in almost all Ukrainian regions that, until now, have tended to vote for pro-Russian candidates. And that result may make the comic-turned-politician even more vulnerable to attacks from the Poroshenko camp about the former’s alleged Kremlin ties. But clearly, the rising hostile political rhetoric observed during this year’s election campaign could translate into street violence come April 21, if the authorities fail to take sufficient preventative steps to rein in politically inclined extremists.